This will be more of a personal article. I have been drawing front wings since 2014, with no background in actual drawing. The reason why I choose Formula 1 front wings, is because they were one of the most regulations-free volumes on the car and became increasingly complex and refined. Decades of front wing research, development, outright copying and some regulations sculpted front wings into in my eyes these beautiful pieces of bodywork. Of course, the way the front handled airflow changed throughout the years, from the very beginning when they were hovering high up in the air mounted directly on the suspension, to airdams, to nearly non-existant trim wings during the ground effect era, to the inwash and finally outwash philosophies. Before we begin, I emplore to read jjn9128's article first https://www.f1technical.net/features/21879, because the article is a strong foundation to understand these regulations and this article builds further on that. We'll not be seeing a change in general philosophy next year. The regulations for 2019 are formed to lock it in, but with extreme restrictions. Let's get into it. 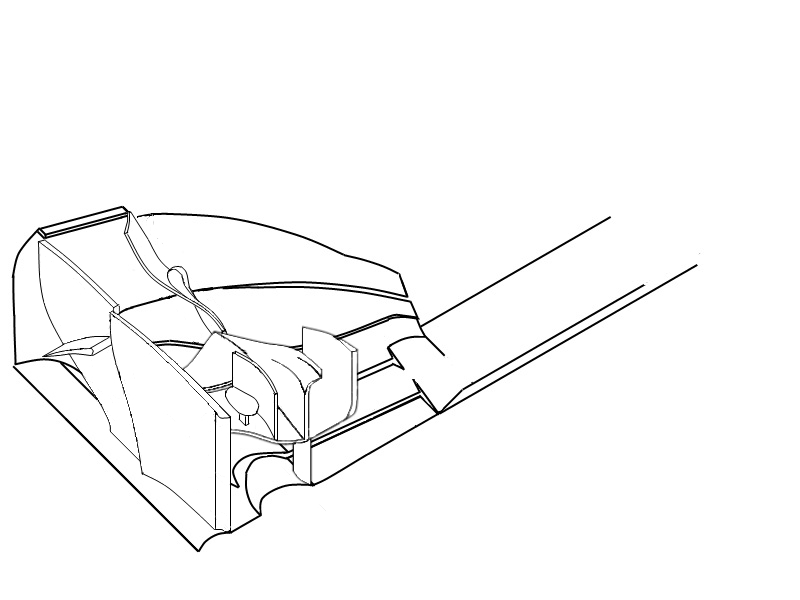 The piece of bodywork that is generally called the endplate will actually become an endplate in function next year. In previous years, this was more of a piece of mandatory bodywork, used as a flow conditioner, redirecting flow around the wheels. The part of the wing that all this time has fulfilled the function of an endplate, limiting/controlling vortex formation, was actually being performed by the wing elements themselves (through extreme curving towards the ground). Yeah let's show those scoundrels at FIA by spending thousands upon thousands of dollars to squeeze every last 0.1° angle out of those endplates, that'll put them on the spot! Teams have been using endplates as mentioned as a flow conditioner, with very elaborate designs at the rear of the endplate to increase outwash. Instead, the endplate will look very crude this year, being a rectangle that bends slightly outwards. The endplate was also vital as a structural support for many smaller aerodynamic appendages. That auxilliary bodywork evolved from simple cascades/upper flaps to very complex cascades, and flow conditioners, winglets, etc attached both on in the inside and outside of the endplate. All functioning to increase that outwash flow. These pieces are banned for 2019. Looks awfully familiar like the "minimal" camera pod connections from Mercedes back in 2014-2016. "Yes Mister Whiting, that is the most minimal connection we can create! If we design it ANY different, it will just break off!" The footplate, the outboard arched section of it that is, will be one of the less restricted pieces, with the regulations stipulating it has to sit in a certain box. The inboard flat part of it will only be allowed to be extended a couple of mm inboard of the endplate, but the arched section atleast can be curved. Curved, but not slotted. So there will be no more slots in the flootplate. This is a trend that Mercedes started in 2014, slotting the footplate to increase flow attachment. Lovely Mercedes elaborated slotted 2018 footplate with its arched section. Coloured and Shaded for dramatic effect.
. Possible footplates for 2019. The one on the right can be considered the standard option, the one on the left a legal alternative. Note that the flat section of the footplate is in effect standardized because the endplate, being standardized itself, fully determines this piece. The wing elements will now be limited to 5 in total, no exceptions possible. The rules are also very prescriptive on the overlap and the vertical gap between the elements, requiring the rear edge to be visible when looking from underneath, but not visible when looking from above (except the rearmost element's rear edge). The slot gap between the elements must sit between 5 and 15mm, measured from the 2 elements their closest points. Example of a slotgap bigger than 20mm in 2018. Note this is still legal in 2019 as it sits in the Y250-Y400 region! This change is one of the least impactful. However, one must be careful with slotgaps as a few mm difference can choke the airflow. Teams will have to carefully test this to ensure no choking happens. 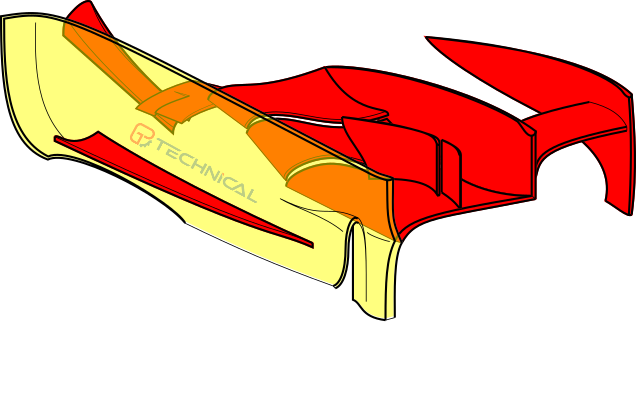 With the exception of the Y250-Y400 region, the bodywork geometry is also very restricted, with limited radii everywhere. It just keeps getting more painful. The wing elements cannot have a "radius to curvature" smaller than 50mm. 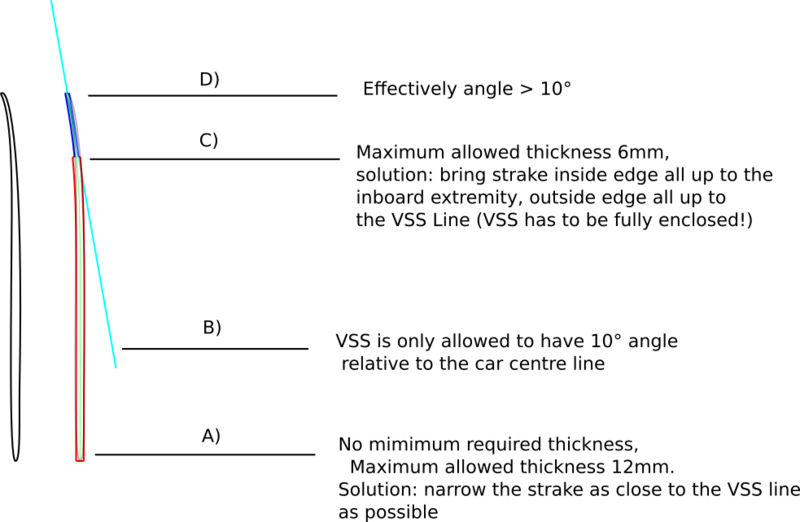 As shown in the illustration, this can be best visualized as a 100mm diameter circle . 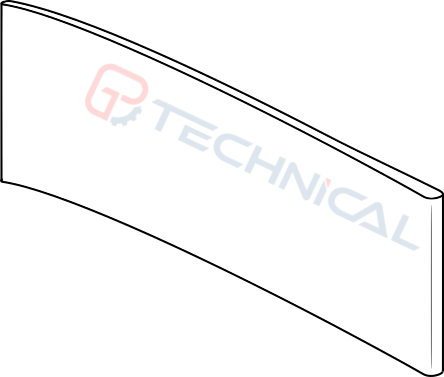 If the circle "fits" on every part of the cross section, the wing is legal. If there is overlap, it's not legal. As jjn9128 explained in his article, this will be tested through a 100mm orb rolling over the elements. Should at one point this orb form a cavity between itself and the element, you have an illegal front wing. This would so enrage Charlie Whiting if he saw it this year. That is effectively ruled out this year. 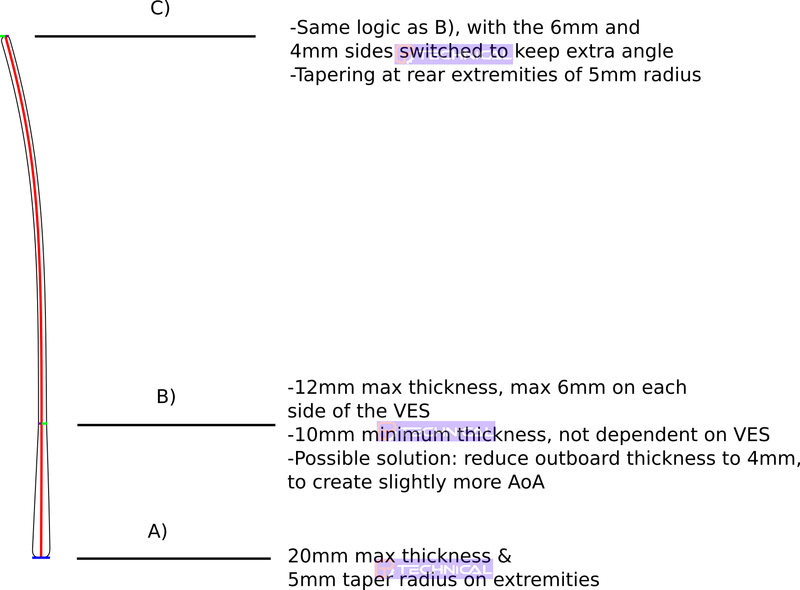 Angles are only allowed to go up to 15°, with the exception of anything inboard of the Y400 line. 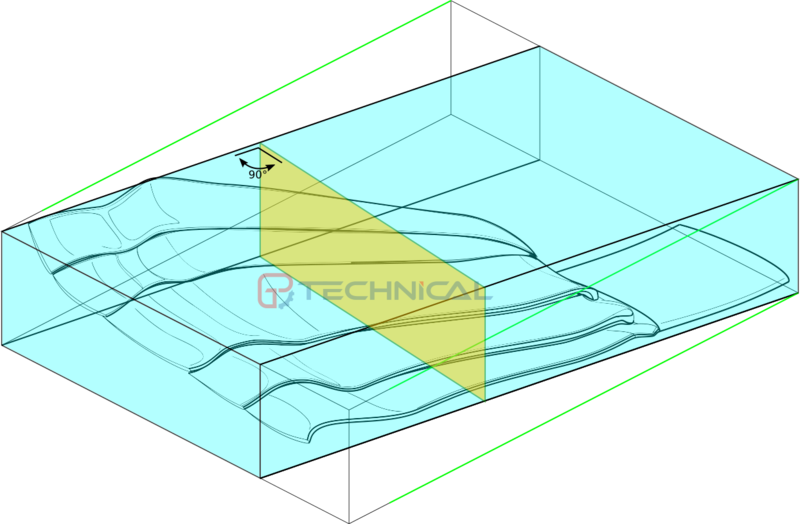 To ensure this, the FIA first determines a vertical plane perpendicular to the diagonal line for the the front edge of the wing prescribed in 3.3.3 a). It's important to highlight this as this is not parallel to the wheel centre line! They call it normal to the diagonal line in the involved regulation article... Speaking out of context, these rules are not normal but insane. Next to test any particular point on the wing elements for legality, we will take said point, determine it's normal vector, done by taking the local cross section of the wing. Next we will allign the normal plane to said point. To determine the angle, another plane perpendicular to the first plane will also be put on the point of measure. Finally, the vector of the point will be projected on the second plane, with the angle being determined between the crossline of the 2 planes, and the projected vector. If this is not making sense, don't worry. There will be a simplified image below. It is important to take the complex explanation in mind however, as ultimately the measurements happen in 3 dimensions, as well as the importance to underline the vertical plane runs normal to the diagonal line. I sincerely hope it becomes clear with this how this regulation works. This will leave some room for a bit of freedom on geometry, but very little. Again, the exception is the bodywork inside of the Y400 line, where the elements curl down to the neutral section. 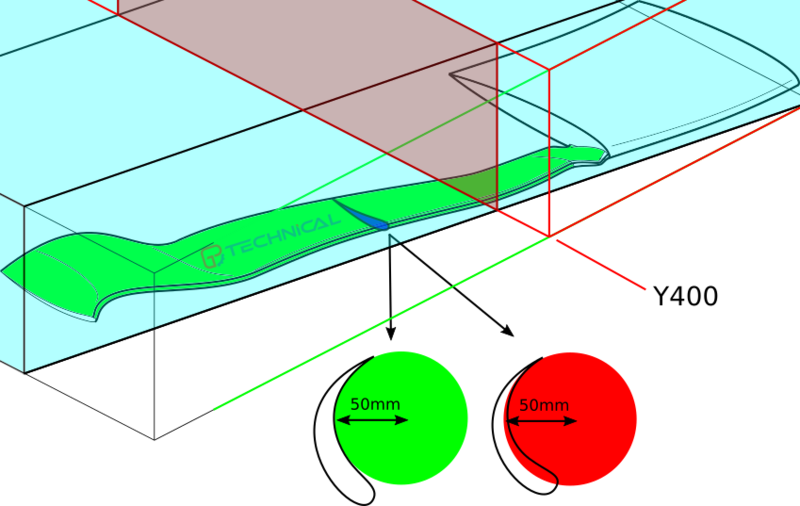 There are also slightly bigger angles possible where the elements meet the endplate through using the maximum allowed 10mm fillet radius, but that's very limited if not insignificant even. Such sculpting, such sophistication. It's almost French. Très bien. 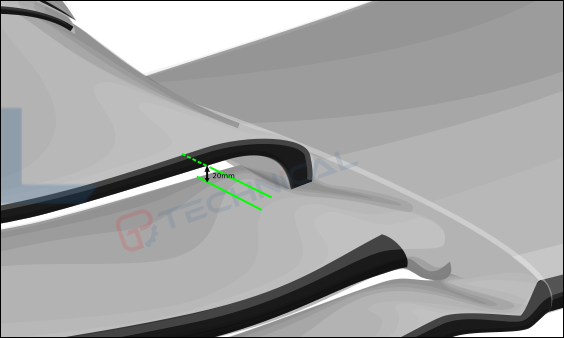 Bodywork underneath the wing, underwing strakes, are now limited to 2 (per side). Like the endplate, these pieces of bodywork require the creation of a virtual surface (Virtual Strake Surface, or VSS) upon which a whole set of regulations are defined to limit design freedom. When the visualisation is done, the strake must be applied so that it fully encloses the VSS and conforms to extremity limitations based on the VSS. It's important to distinguish the virtual, 2-dimensional strakes from the actual, 3-dimensional (having a width) strake as not all rules apply to the final dimensions. Before being able to determine the form, let's first determine the area the 2 virtual strakes can sit in. That's simple enough: they must sit in a box underneath the wing between the Y500 and Y800 vertical planes. Inside this box the 2 strakes can be applied in any position (disregarding the regulations on form for a moment), but the 2 virtual surfaces need to be at each and every point 50mm apart. Again, the virtual surfaces and not necessarily the actual strake (which is built around the virtual one). After that, we can determine the 'moveable' position of the VSS. It must sit in a 20mm box inside the bigger red box. Below you can find the strake we came up with in isoview. Note that unlike the endplate, this doesn't come down to practical standardization, as teams used a variety of (near) straight strakes and bend strakes before this year. Practically speaking, the only limitations here are positioning, less extreme angles of curvature and the physical number of strakes. Teams will also not be able to use Gurney flaps as strakes, as late changes to the regulations cleared that up. 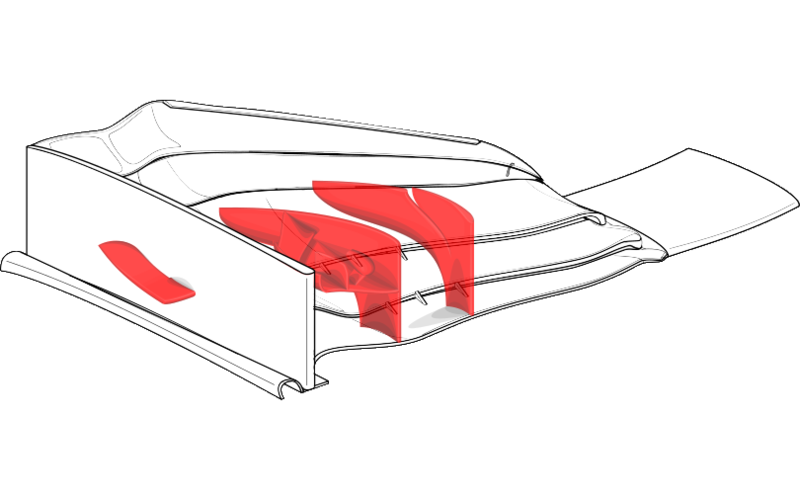 A single Gurney flap will only be allowed on top of the rearmost element within a certain box. 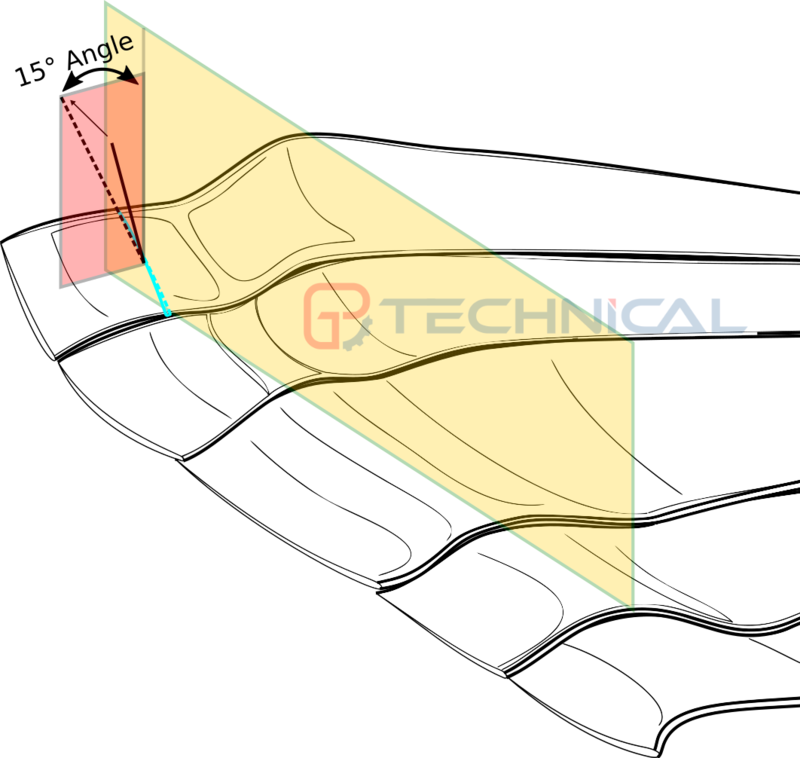 Infact, the Gurney flap has to abide the same 3.3.6 a) iii) regulation with the exceptions of 10mm on their extremities, so you can't angle them more than 15° relative to the plane described in 3.3.6 a) iii). Good old Gurney flap. Does anyone actually know how long it has been around? Let us know in the discussion thread. I mean it still looks decent, but I'm afraid there will be a lot of convergence happening and thus a lot less variety. -The converging/splitting happens within an imaginary single profile. It's not certain if this actually gives any benefit versus a conventional 5 element "through-and-through" wing. Most if not all teams used before 2019 atleast 5 of those through-and-through elements. A possible benefit is to create more Y250 vortex control at the upperflap tips and more airflow attachment at the outboard lower elements. But, that will require closing a slot somewhere else above or below the opened slot. Something gained, something lost. Example of how the above would translate visually. It's not a certainty. All in all, this makes the writer of this article quite sad. Of course these pre-2019 wings where only made to get every last drop of aerodynamic performance and not for aesthetics, but for me they really became these subtle, flowing pieces of art. Throughout the years I had a great time drawing them and even updating them (and I will continue to do so, despite the setback). Along with the wings, my skill in drawing them, not as 1 image or as an overlay but as their separate little bodywork pieces overlapping eachother in the right position, improved from a very basic drawing to what it is today. The one that started it: the 2014 pre season Mercedes front wing. Some say there is beauty in simplicity, I'd say good thing I got better!